"My edges are gone. I'm sea glass. If you look hard, you can see right through me." When a car accident takes the lives of her parents, child genius Willow Chance is set adrift. She finds no joy in the things that usually interest her: germs and diseases, gardening, counting by 7s. On top of living life in a haze, she has no relatives and no one to take her in. Somehow she gets mixed up with a crew of misfits: loser social worker Dell, at risk teens Mai and Quang-Ha, taxi driver Jairo, and nail technician Pattie. All of these people are damaged in some way, but through their relationships, they heal and move forward. 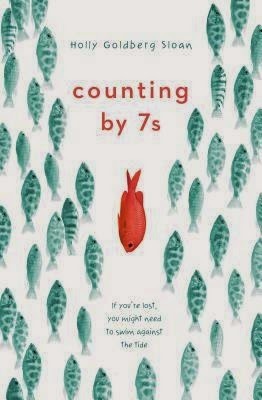 After reading an entire zombie series, I really needed Counting by 7s. While I complained that Holly Goldbery Sloan's I'll Be There was too saccharine, I found this novel to hit just the right balance. Yes, there were many unrealistic elements like characters winning the lottery and unexpected riches, but if you think of the story as a fairy tale for middle grade readers, you can swallow the inconsistencies. These are characters that the reader wants to succeed, and they do. This is the book that I will hand my students after they have read something sad and need a hopeful novel.